A good tactical light is a must have They give you a tough and robust option for concealed carriers, cops and soldiers. 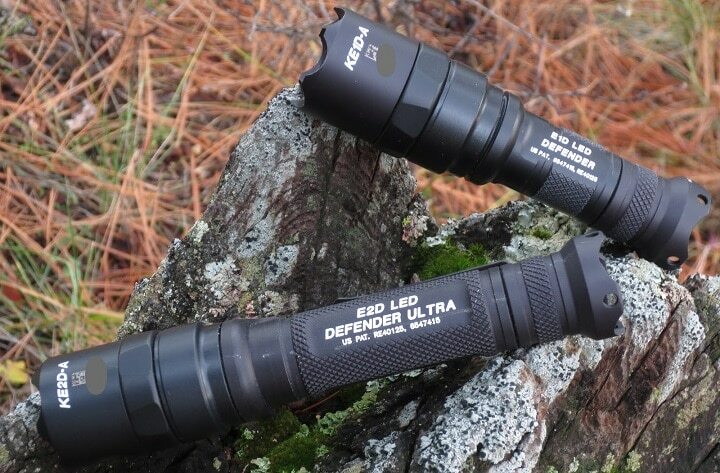 Tactical lights fulfill many different duties and need to be strong, bright, and easy to use. With so many options out there bragging about being tactical lights it can be hard to find the right tactical light for you. 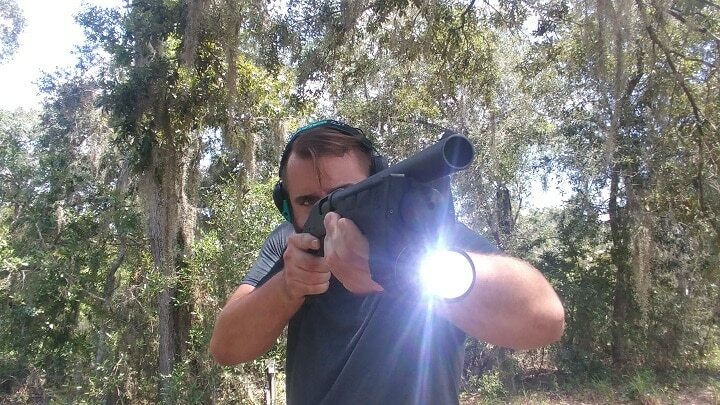 We are going to teach you how to find the perfect tactical light and leave you with a few of our favorite selections. Tactical lights are designed for a wide variety of purposes. Of course you have your everyday tasks that utilize a light for everything from finding your keys to lighting up a path. Those normal tasks are one thing, but the duties of a tactical light are a little more dynamic. A tactical light is often regulated to more important and dynamic tasks. For example, they are often used for serious searching tasks. This could be for suspects and fugitives, as well as simple search and rescue tasks. Tactical lights may be called into to play to light up a house during a raid or to positively identify a target before triggers are pulled. In certain situations these lights can even be used as weapons. Most of these lights are made from metal and can be used to strike an opponent in a close quarters situation. For civilians a small tactical flashlight can be their only choice in gun and knife free zones for a hand to hand weapon. Tactical Lights are broken up into two categories, Handheld and Weapon mounted. Handheld lights are exactly what they are described to be. They fit in the hand. They should be easy to pocket, or to attach to a duty belt or tactical gear. Hand held lights are often more powerful and pack more batteries for a longer life. The downside is they occupy an entire hand, making it a juggle to manage both a weapon and handheld light. 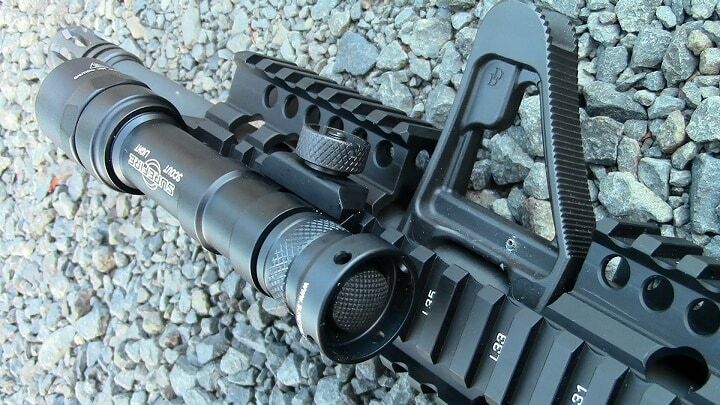 Weapon mounted lights mount to a weapon and give you the ability to always identify a potential threat. Positive identification is critical to a shoot. The downside is that whenever you are using a weapon light you are pointing your weapon at everything your light is shining on. Weapon mounted lights are most often smaller and have a shorter battery life. This is to keep them compact and easily mounted on a weapon. Lumens is a measurement of light output. This is a method of describing how bright a light is. This does not tell you how wide the beam is, or what the effective range of the light is. Brightness is only one factor in the determination of range. The reflector, lens, and bulb also make a difference in a lights range. Lumens can go from 5 to 5,000 and most tactical lights fall between 200 to 1,000 lumens. Most lights will have multiple modes. This could be a low, medium, or high settings, as well as special settings. 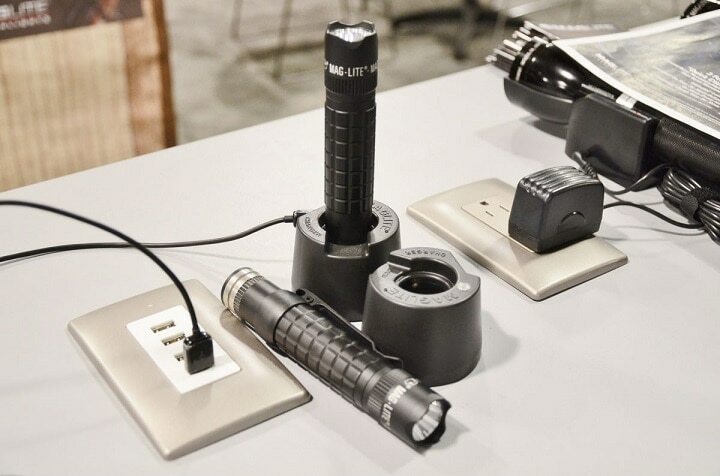 Tactical lights with multiple settings often preserve battery life, and give the users a more robust system for searching. Momentary is a setting that allows you to keep the light on for only as long as the button is being held down. 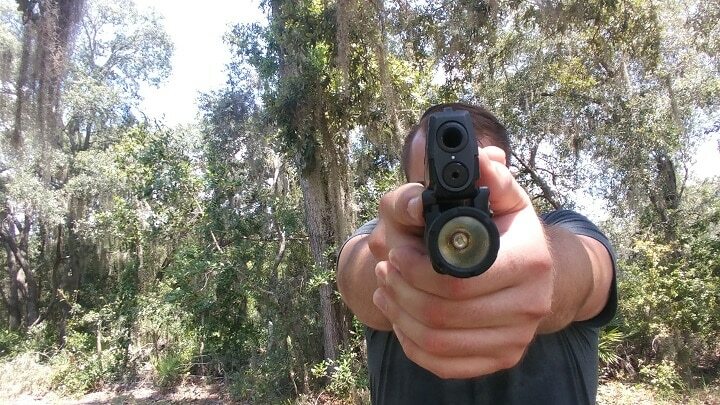 This is a big feature for a tactical flashlight. It allows to flash an area and in an instant turn the light off. This keeps the person who is carrying the light from being easy to see and track as they search. Strobes are often used to disorient and distract a potential attacker. A bright strobing beam makes it hard to see and can cause serious disruption to reaction times and the throught process of those on the receiving end. A strobe can also be used as a signaling device as well, and is especially handy for locating those in trouble. 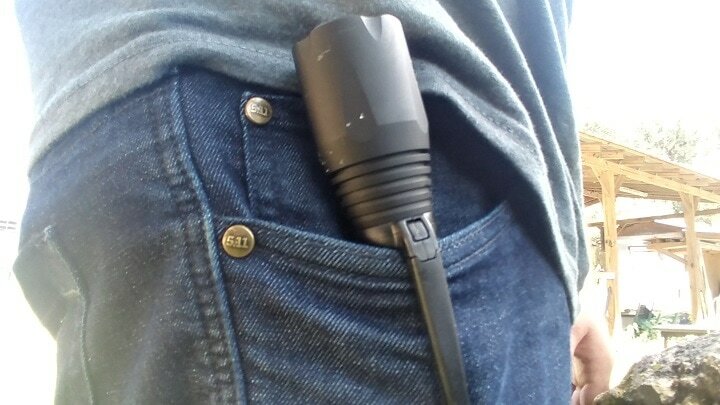 The power source of your flashlight is more important than most of you consider. Batteries keep the light running right? So what should you look for in batteries? Choosing a light that takes a common battery is important. If you choose a nice light with an oddball battery you’ll find it frustrating to special order those super hard to find Lithium Ion CR quadruple A batteries. Rechargeable batteries are great but what if they die? Can you load a spare rechargeable or will you need to stop, plug it in and wait? One solution is dual use systems. These lights allow you to drop in standard batteries, like CR123s and get the light back-up and going. In my experience with tactical lights you’ll find hundreds of junk ones and have to pick through the crap to find the perfect one. I’ve done the digging, the unfortunate money spent to test them, and found 10 of the best. 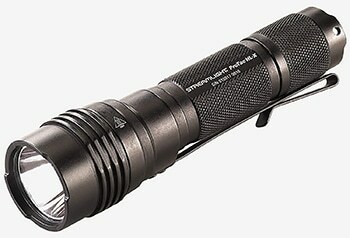 Surefire is by far the number 1 choice for military and police flashlights. These high quality, well made flashlights are extremely well made and have a reputation for nothing but excellence. 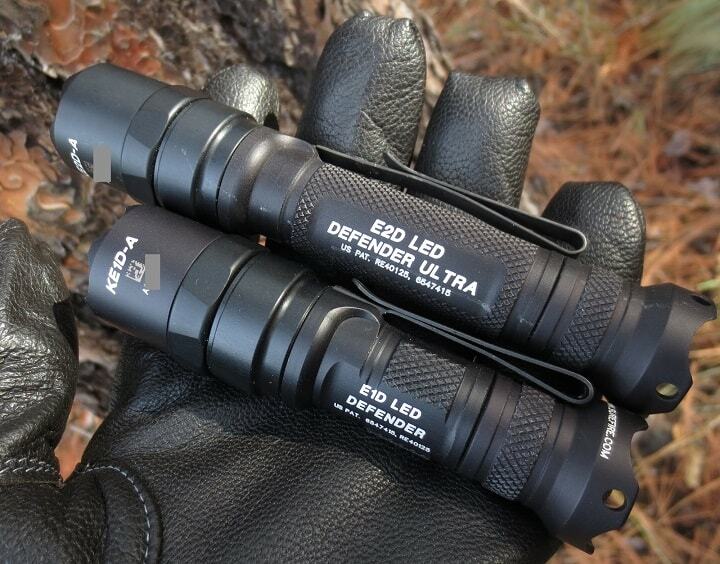 The Defender series is the smaller, everyday carry orientated flashlight. This small, but might light fits easily in the pocket and is well suited for civilians, police, and soldiers. It runs off of two CR123 batteries and can emit 600 lumens on high and 5 lumens on low. The body of the Defender is mil-spec anodized aircraft grade aluminum. This makes the Defender plenty tough, and the type of light that will last through decades of hard use. The Defender features a crenelated strike bezel that makes the Defender a nasty self-defense tool. The bevels design will take flesh and blood off the body when used appropriately. On the opposite end the tail cap is also scalloped, which will make a might nice tool for taking flesh as well. It's not as big as the bevel, but does give you an option for a reverse swing if need be. The bevel design also makes it a solid glass breaker as well. As a vehicle light it could save your life should you need to escape through a less than optimum exit. The Defender utilizes a TIR lens that casts a straight, long range light that's impressive for the little light. The TIR lens makes the beam focused, but leaves plenty of room for a bit of peripheral vision. The Defender is an amazing flashlight, and perfect for concealed carry or to reduce the footprint of your duty gear. The price of The Surefire Defender varies, so check the latest price at Amazon. 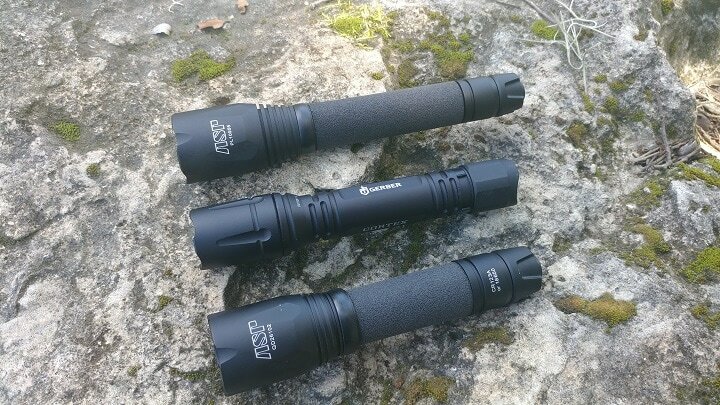 The ASP Triad AA is a powerful handheld light that comes from the maker of the famed Asp collapsible batons. 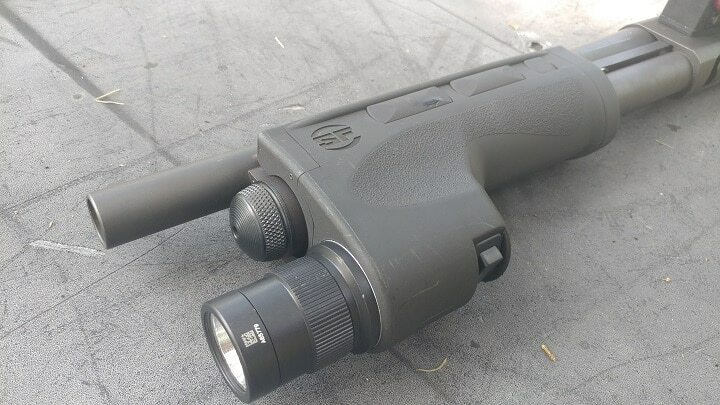 If a company like Asp creates a flashlight you can bet its a strong one. 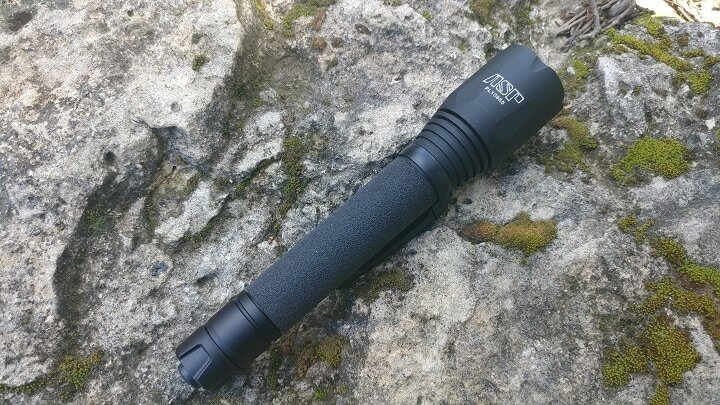 The ASP Triad AA is a duty sized light that's a bit long and heavy for EDC and pocket carry. Its perfect for belt mounting, or for being stowed in a car, backpack, and more. The Asp Triad’s slightly long size does make it a solid impact weapon. The bevel is textured and ridged so it can be used as an effective weapon. The body of the weapon is made entirely from metal, so it’s strong enough to strike someone’s face, glass, and more. 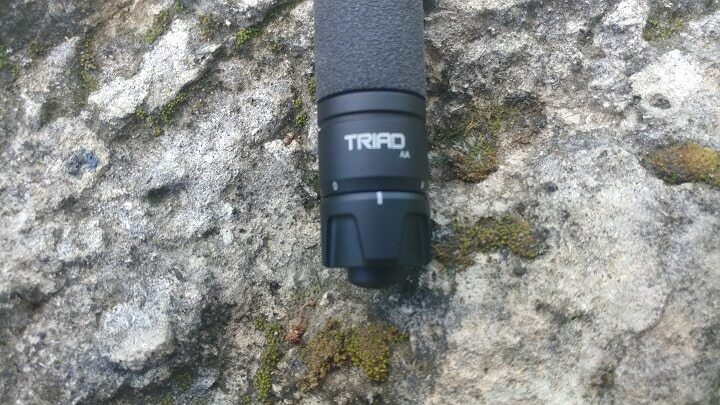 The Triad is made from 6061 T6 aluminum that’s coated with a mil spec anodization. 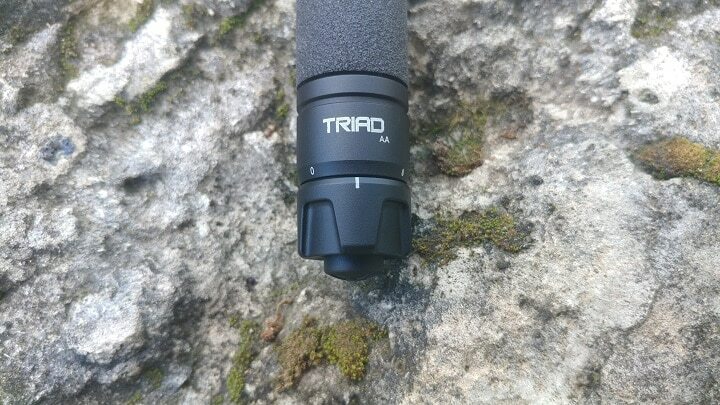 The Triad is a very well built and dependable tool. The end cap has three different positions. One is a constant on, one is momentary, and the last is a disabled slot. This ensures the light doesn’t unintentionally come on at the wrong time. If it does come on at the wrong time it could mean disaster for those involved in dangerous work. The Asp Triad is well made, and sports a Cree XPG2 LED, gold plated connectors, and a polished aluminum reflector for excellent clarity. The light it casts is extremely bright and offers end users an impressive range. 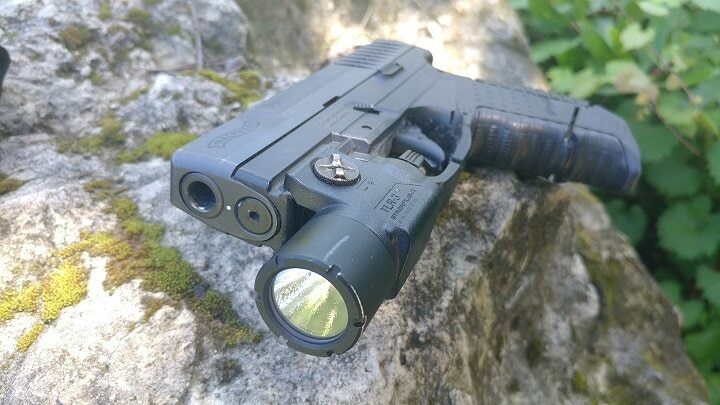 It’s a simple, effective, and affordable tactical light. The price of The ASP Triad AA varies, so check the latest price at Amazon. The Fenix PD35 is a small, but robust tactical light designed to cast a blinding light. The FD35 packs 1,000 lumens into a pocket friendly package. This lightweight knife is made from anodized aluminum and is remarkably tough. The Fenix PD35 is outfitted with a textured strike bevel that could deliver some nasty blows and create some serious pain when applied correctly. The PD35 sports a tactical tail switch that’s taller than average, this allows for a constant or momentary on. The powerful little light is only 5.4 inches long and weighs a mere 3.1 ounces. The PD35 is versatile and runs off either two 3V CR123A batteries or a single 18650 Li-ion battery. This is a great feature in my opinion. It allows you to pack a rechargeable battery for your day to day use. Let's say you’re a cop and your night runs long and that rechargeable battery dies. It's not like the day ends because your light is dead. You can simply toss in two common CR123 batteries and you are back on the prowl. 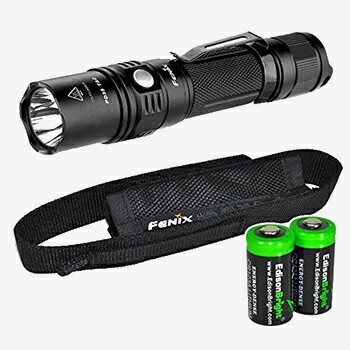 The Fenix PD35 has three different modes, the first is turbo which is 1000 lumens that will last for 1 hour and 10 minutes. Then you have your low power setting that is only 60 lumens, but will last over 5 hours. Lastly you have strobe, which gives you a disorientating tool should you need it. The Fenix PD 35 is an outstanding addition to any duty belt, and is priced affordably enough. The price of Fenix PD35 Tac varies, so check the latest price at Amazon. 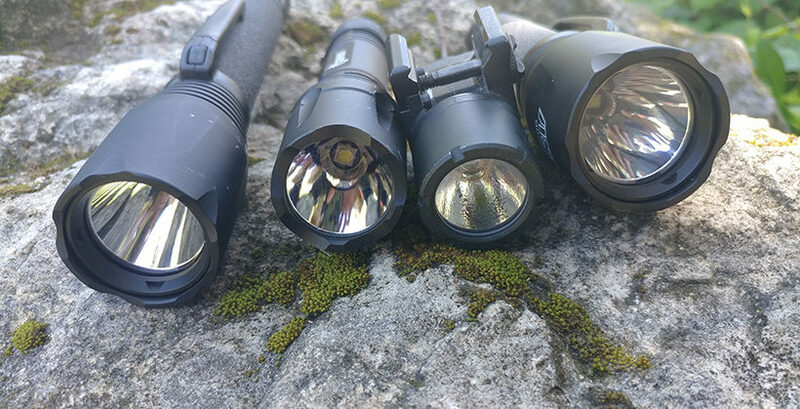 Streamlight makes a number of successful and well made weapon lights, but they also make handheld designs that are tactical in nature. The Streamlight Pro Tac is an outstanding little light worth of both everyday carry, and duty use. 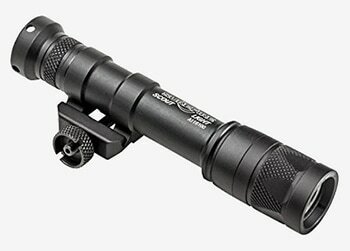 The Streamlight Pro Tac is a simple light, but a powerful and versatile one. The Pro Tac packs 1,000 lumens in its compact package. 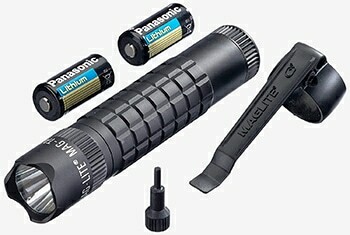 It has multi battery configuration and can use two CR 123 batteries, or a single Lithium ion rechargeable 18650 battery. As we mentioned above this is perfect for tactical use. If the rechargeable battery dies all you need to do is toss in a couple of CR 123 batteries and you are ready to keep going. The Pro Tac also has a removable pocket clip, and anti roll bevel. 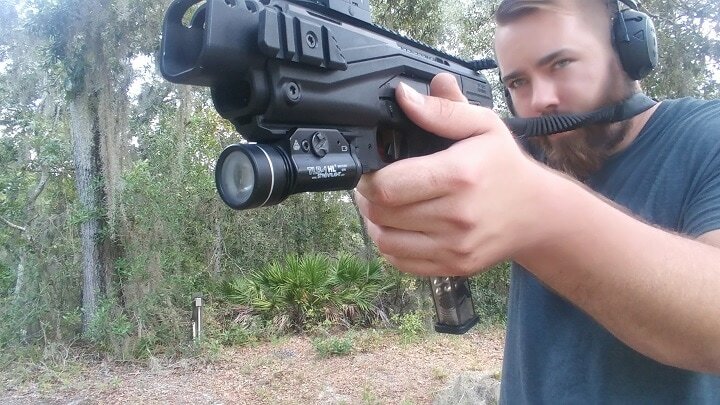 Additionally Streamlight produces a weapon mount that allows you to mount the Pro Tac to a picatinny rail on long gun. This gives you an instant weapon light. The Pro Tac is compatible with all manner of pressure switches which makes it perfect for rifle use. The Pro Tac sports a high, medium, and low modes, as well as a strobe. The end cap button can even be programmed to utilize the different modes in different orders. Lastly, the Pro Tac is shock and water proof, and can be fully submerged. The price of Streamlight Pro Tac varies, so check the latest price at Amazon. 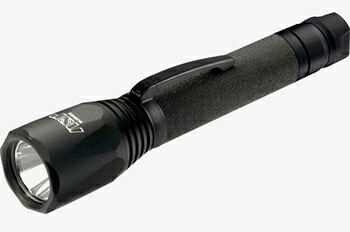 Maglite may be the original name in tactical flashlights. They are most famous for their massive D cell lights that weren’t just lights, but good self-defense tools. Maglite has evolved with the times though, and the Maglite Mag Tac is an excellent representation of what Maglite can do. The Maglite Mag Tac light is much smaller than the old school D cell lights. If the old lights were hammers then the Mag Tac is a scalpel. The Mag Tac uses only two CR123 batteries and can cast a 320 lumen beam 200 yards out. The Mag Tac has a crowned bevel so it can still be used as a brutal weapon for pain compliance and as a striking tool. 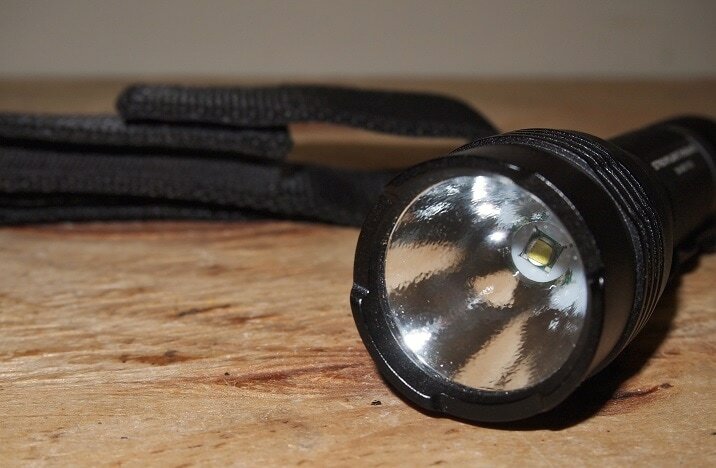 The simple, lightweight flashlight is pocket sized and perfect for a variety of purposes. The Mag Tac light also packs a strobe light, as well momentary on option. The Mag Tec has a switch activated QuickClik system that makes changing between the modes simple and effective. There is nothing fancy here and you can cycle between the different modes with ease. The light is also drop proof, and waterproof. It’s designed with a heavily ribbed and textured frame that’s easy to hold regardless of the conditions of your hands. It also makes it easy to keep the light in your hands when striking an opponent, just so you know. The price of Maglite Mag Tac varies, so check the latest price at Amazon. 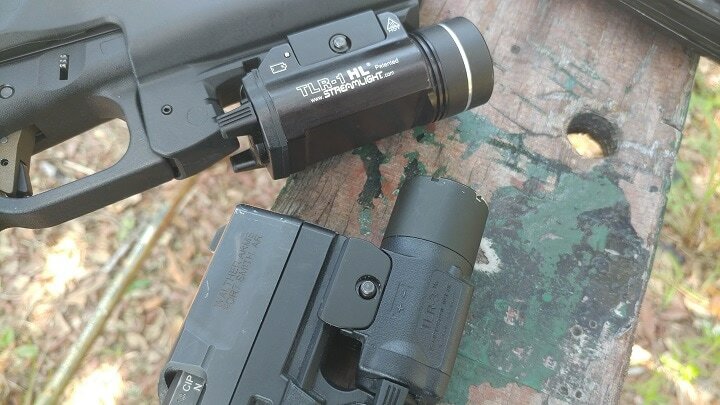 The Streamlight TLR 1 is a weapon mounted light and one of the big 2 weapon mounted lights largely recognized as the best of the best. The benefit of its commonality is near endless. 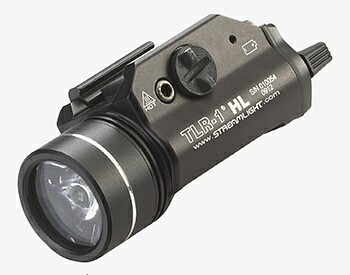 The Streamlight TLR 1 is customizable with different options to make the guns compatible with both handguns and rifles. 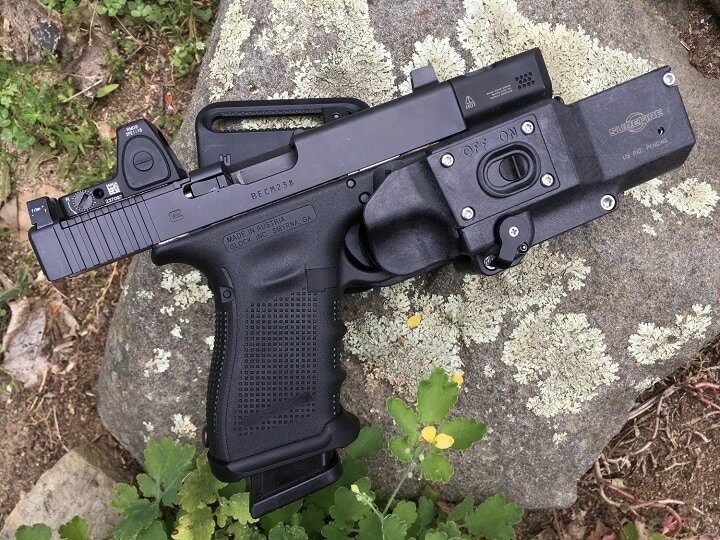 The Streamlight TLR 1 commonality also makes it easy to find holsters that are compatible with the holster. The TLR 1 is a powerful light and can be found with lumen counts from 200 to 800. Battery life is dependent on the model chosen, but all models run off of standard CR123s. The Streamlight TLR 1 is a powerhouse and insanely easy to use. It’s one of my personal favorite lights and I’ve used it on shotguns, rifles, and handguns. It never slows down. The TLR 1 features ambidextrous switches that are easy to access with both your trigger finger or even your thumb. You can also attach and detach the light with a single hand and you don’t have to cross the muzzle to do so. The TLR 1 functions with a 50,000 hour C4 LED bulb that casts a wide, clear, and bright light through the darkness. 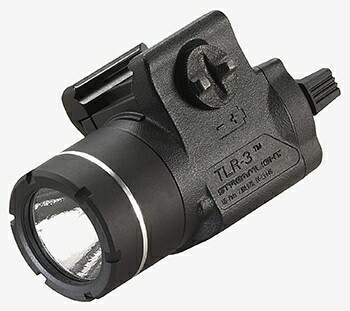 The TLR 1 also has the ability to utilize a strobe that can disorient an opponent. The TLR 1 also has a momentary feature to help utilize flash search techniques. The TLR 1 is designed for full sized handguns, as well as rifles and shotguns. It does some bulk to your weapon, but very little weight overall. The TLR 1 is surprisingly affordable, and perfect for home defense and duty use. The price of Streamlight TLR 1 varies, so check the latest price at Amazon. If you really need a weapon light, but are on a budget then the Streamlight TLR 3 is for you. 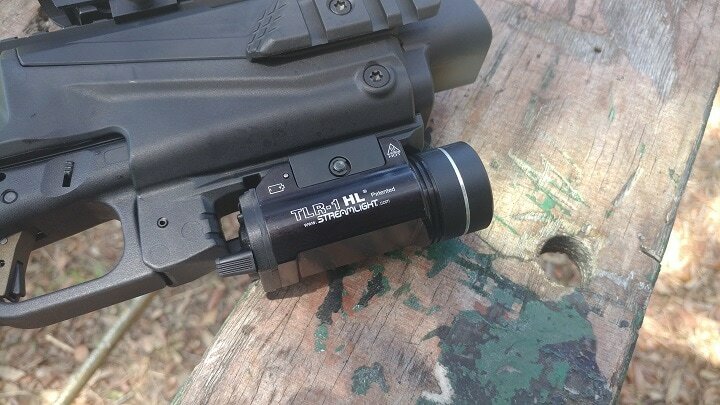 This light is smaller than the TLR 1 and does work very well on compact handguns, however, there is nothing saying it will not work on full sized guns either. This is one of the highest quality lights at this price range. The TLR 3 is made mostly from super strong polymer which really helps cut weight. On small guns the presence of a light can really throw the balance off. However, the TLR 3 is perfect for these small guns. It only weighs 2.32 ounces with the battery installed. Speaking of batteries that is the TLR 3’s one weak point. The battery is a 3 volt CR2. These batteries are slightly expensive, and a bit uncommon. The TLR 3 packs 125 lumens with a 1.5 hour run time. The light features a momentary switch, but does not have a strobe function. The TLR 3 also attaches to any standard rail, and there is options for HK’s own rail system. The TLR 3’s small size makes it an amazing choice for concealed carry. 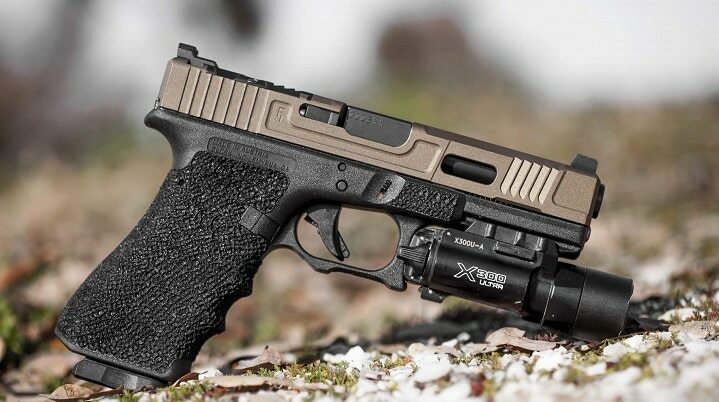 Very few lights focus on concealed carry and its nice to see a small, but powerful option for concealed carry. That being said the TLR 3 isn’t a bad choice for home defense either, although for duty use it is a bit small, and potentially underpowered. It’s small size and 125 lumens make it better for close quarters than long range outdoor use. The price of Streamlight TLR 3 varies, so check the latest price at Amazon. The Surefire X300 is a powerful and well built weapon light trusted by armed professionals worldwide. 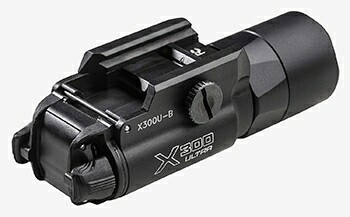 The X300 is the second of the big two weapon lights on the market. The X300 is also the superior option, and the option I’d choose for combat and duty. The Surefire X300 is an absolute tank. It can take any and all the abuse you can toss at it. It’s a rugged and powerful light that will function for years and years. 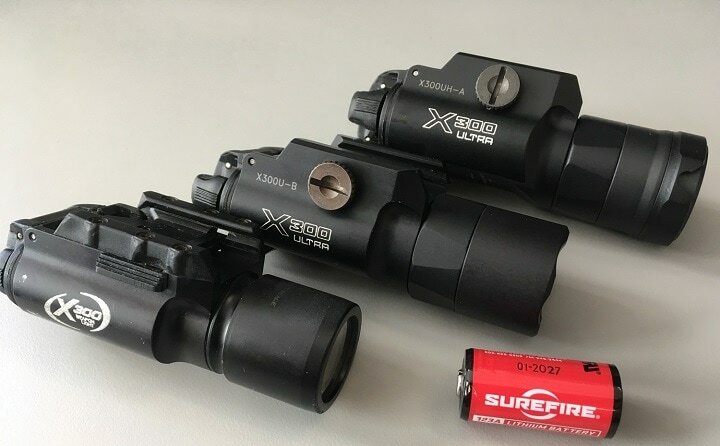 The Surefire X300 is made almost entirely from metal and features all the high end touches flashlight junkies love. The TIR lens system provides one of the longest range and clearest light beams on the market. The Surefire X300 is perfect for handguns, rifles, and shotguns. The X300 is another light that’s compatible with a wide variety of holsters. This includes duty and concealed carry models. 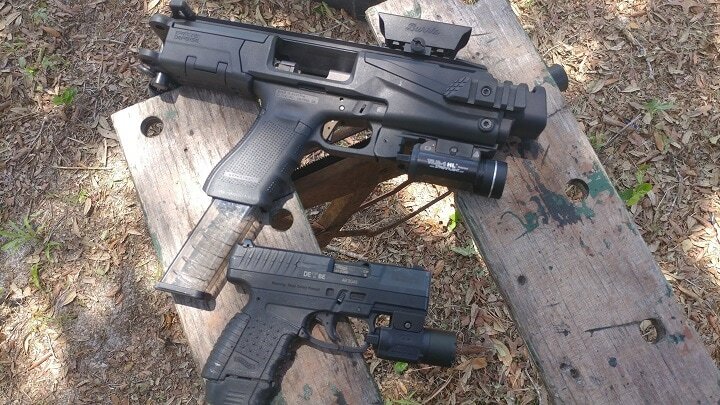 The X300 is a big light and is best used on full sized handguns at the minimum. The X300 Sports ambidextrous switches, as well as multiple modes of operations. This includes constant on and momentary switches. The X300 is compatible with long gun pressure pads, as well as DG pistol grip options. The X300 is basically everything proof. This includes shock, recoil water, and more. The X300 is the choice of armed professionals for a reason, and its well worthy of the Surefire name. The price of Surefire X300 varies, so check the latest price at Amazon. If you are a shotgunner on an entry team, a soldier issued one, or someone who guards their home with the mighty 12 gauge then the Surefire DSF series is for you. When it comes to tactical lights on a shotgun there is no better choice than the Surefire DSF series. The DSF series of shotgun lights are a fascinating design. The DSF is both a flashlight and pump all in one. The light is built into the pump, and the pump features all the controls to make it work. The DSF series is very robust and can easily withstand the recoil from thousands and thousands of 12 gauge rounds. The integrated light into the pump action keeps thing simple and keeps the light always focused forward, even when the action is cycling. 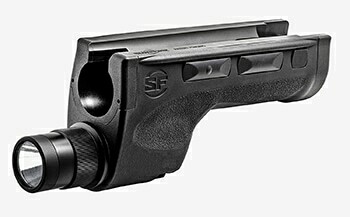 The Surefire DSF features ambidextrous controls, a momentary and constant on switch as well as a low and a high mode. The low mode casts 200 lumens and the high shoots out 600 lumens. The DSF series is my personal favorite weapon light. My Remington 870 wears one and it's my go to home defense weapon. The beam it casts is wide and bright, and gives you a bright and consistent picture. It’s perfect for home defense and police work. The Surefire series on my guns have seen hundreds of rounds and still lights up with the press of a button. The ambidextrous controls are fantastic and easy to reach. The massive buttons would be impossible to fail to reach, even when you are stressed. 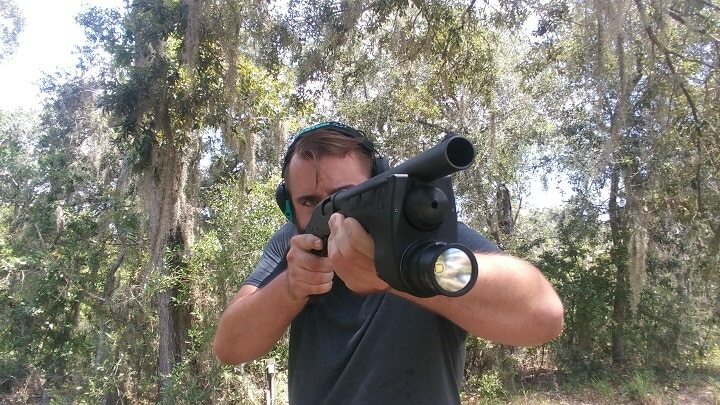 The design is perfect and there is no better tactical light for the shotgun. The price of Surefire DSF varies, so check the latest price at Amazon. 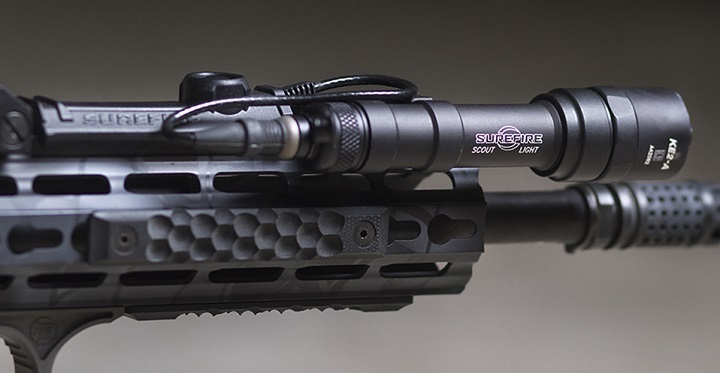 If you need a tactical light for your rifle the Surefire M Series Scout is for you. This is the choice of armed professionals around the world. The Surefire Scout series is the weapon light used by Green Berets, Navy Seals, Army Rangers, Marine Raiders, and more. The Surefire M Series Scout is the choice of these men for a reason. Its rugged, reliable, and one of the most robust lights in the world. The M Series is somewhat compact weapon light, and comes with an integrated picatinny mount. 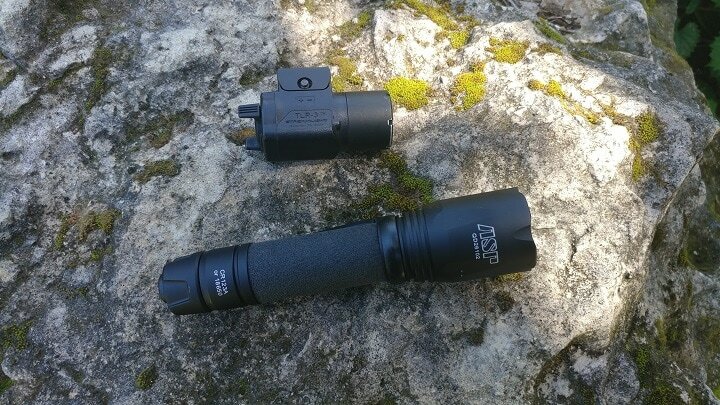 The Surefire Scout packs 500 lumens of power and comes in two different sizes. One is remarkably small and impressive. The Scout uses the TIR lens Surefire is famous for that casts a long range light that’s clear and best described as brilliant. The Scout series is compatible with Surefire’s pressure switches for easy access regardless of the position on your rifle. The recoil proof LED emitter regulates light flows and prevents any accidental shut off while shooting for extended periods of time. The Scout series is robust and designed to last for years of heavy and hard use. This is by far the best rifle weapon light on the market. The price of Surefire M Series Scout varies, so check the latest price at Amazon. Purchasing a tactical light, or multiple lights is one way to make sure you are equipped for nay and every situation. Having a tactical light should be part of every duty belt, home defense set up and soldier’s loadout. A good light can save lives, and is one of the best tools you can have for day to day use. Remember these lights are investments and should be treated as such. 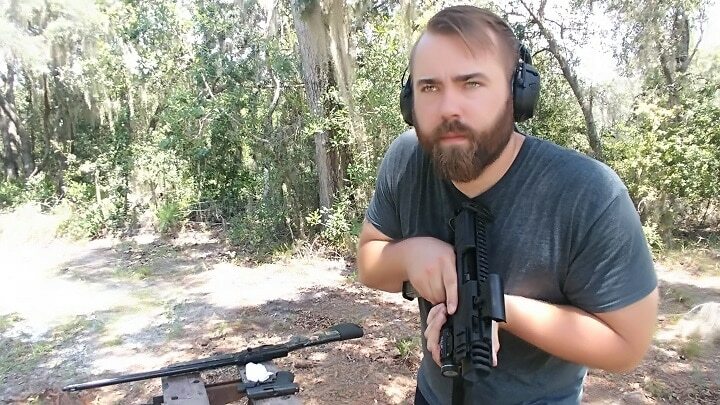 Travis Pike is a former Marine Machine gunner who served with 2nd Bn 2nd Marines for 5 years. He deployed in 2009 to Afghanistan and again in 2011 with the 22nd MEU(SOC) during a record-setting 11 months at sea. He’s trained with the Romanian Army, the Spanish Marines, the Emirate Marines and the Afghan National Army. 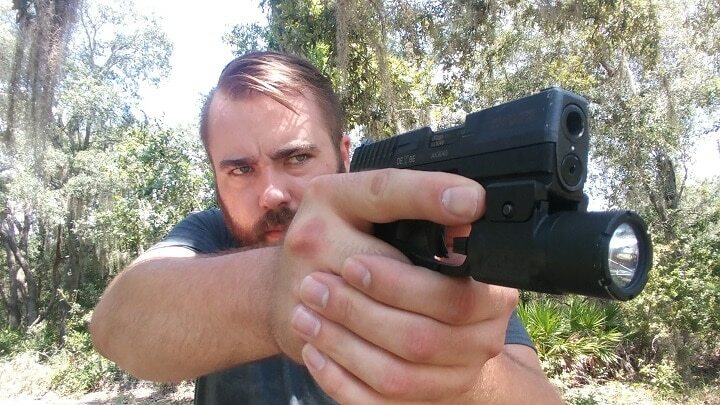 He serves as an NRA certified pistol instructor and teaches concealed carry classes. HuntingMark.com is a participant in the Amazon Services LLC Associates Program, an affiliate advertising program designed to provide a means for sites to earn advertising fees by advertising and linking to Amazon.com. *Amazon, Amazon logo and the product images linked to the amazon are trademarks of Amazon.com, Inc., or its affiliates.